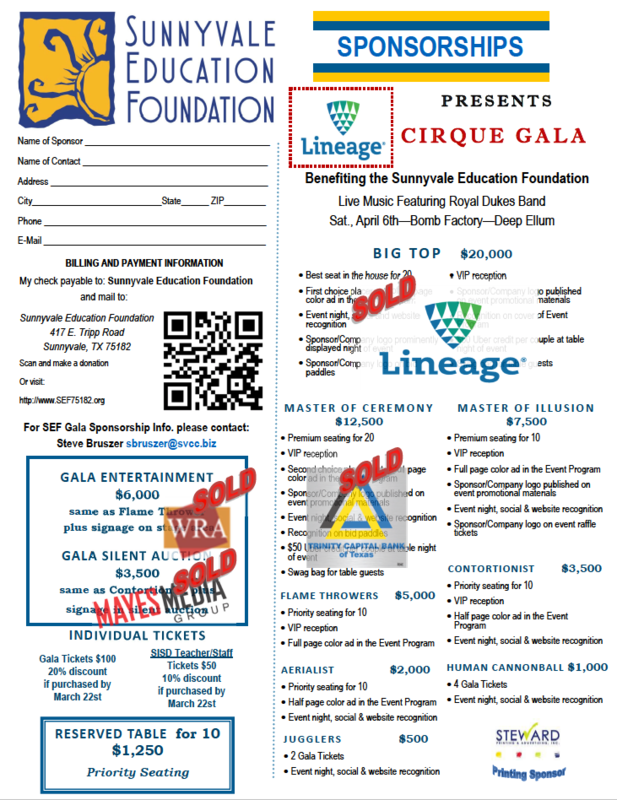 The Sunnyvale Education Foundation has announced that Lineage — one of Sunnyvale’s newest businesses — will once again serve as the $20,000 presenting sponsor for this spring’s annual SEF Gala and Auction. “Besides changing the skyline in Sunnyvale with their new building structure, Lineage Logistics is committed to changing and improving the lives our our students through scholarships and teacher grants," SEF President Steve Bruszer said. "Their commitment to once again return as Presenting Gala Sponsor is a direct reflection of their mission statement which is built upon a legacy of family values and integrity. Thank you Lineage Logistics!" Lineage will join Trinity Capital Bank as a top-level gala sponsor this spring. The bank will return to the gala as a $12,500 “Master of Ceremony” sponsor. Other sponsor levels are available and may be found at www.sef75182.org. The theme of this year’s gala is “Cirque”, offering a glimpse into a night under the bigtop. Attendees will enjoy entertainment inspired by the theme among friends while dressed in cocktail attire. Come to the Lineage Cirque Gala, benefitting the Sunnyvale Education Foundation on April 6 at 6:30 p.m. at The Bomb Factory in Deep Ellum, Dallas and be a part of the foundation’s mission to support the Sunnyvale ISD by funding exciting new learning opportunities for Sunnyvale students and teachers. Since its inception in 1999, SEF has partnered with the Sunnyvale community to raise more than $1 million. LETTER FROM SEF PRESIDENT, STEVE BRUSZER. Happy New Year! I hope your 2019 will be filled with prosperity, peace, happiness and good health. The Sunnyvale Education Foundation (SEF) is a 501 (c) (3) nonprofit tax-exempt philanthropic organization that has raised over $1,000,000 for SISD teacher grants and student scholarships. SEF provides funds for educational programs and activities which have either not been funded or have been under-funded by the normal operating budget. As our district grows, so does the necessity, and opportunity for our supplemental funding to not only maintain, but hopefully enhance the educational standards currently in place at SISD. On December 5, 2018, the SEF Board hosted a sponsor appreciation breakfast to thank the leaders (either individuals, businesses or civic organizations) of our community for their continued support of SEF and SISD. In fact, due to your generosity, last year was a record-breaking year for fundraising. This school year, we will distribute over $150,000 for SISD teachers grant and student scholarships. The teacher grants will enrich the learning experience of students from each school campus including the new intermediate school scheduled to open next fall. The 2019 Spring Gala will be held at The Bomb Factory in Deep Ellum on April 6 at 6 p.m. This is a different and larger venue than last year. Entertainment will be provided by The Royal Dukes Band. Please review the SEF sponsorship form for sponsor opportunities, pricing and related privileges. I would like to thank you in advance for your consideration, support and continued commitment to our district, teachers and students. Feel free to contact me if you have any questions about SEF, Gala sponsorship or any ways you can help and support SEF. I hope to see you at the 2019 SEF Spring Gala! 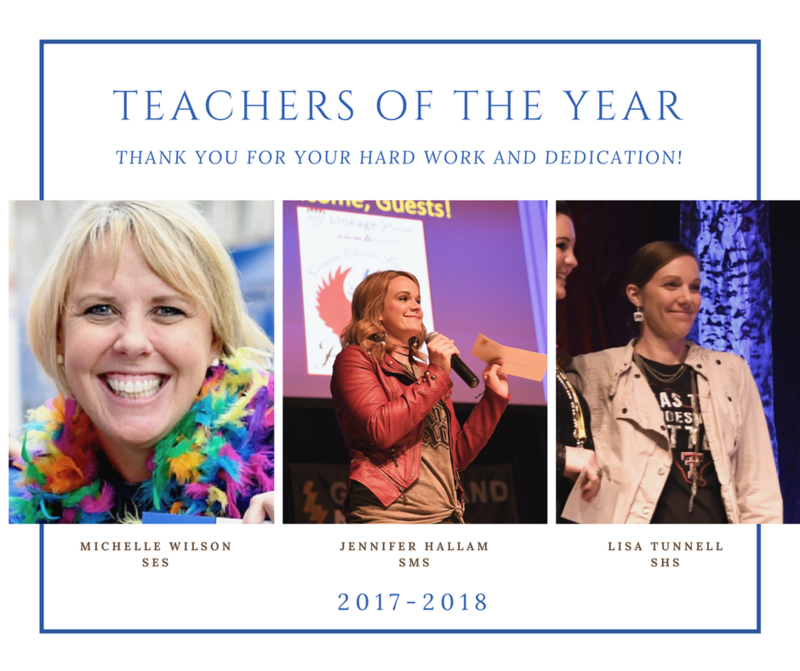 Congratulations to our 2018 Teachers of the Year!! We are extremely proud of your hard work and dedication for our schools and kids. We appreciate all of you.